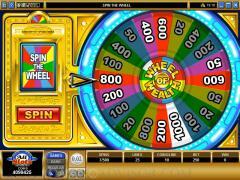 Wheel of Wealth: Special Edition is a video slot game offering from Microgaming, the world's acknowledged leader in online casino software. This is a five-reel game, with 25 paylines, allowing for a maximum bet of 250 coins. One of the bonus games allows for the opportunity to earn a payout of up to 10,000 coins. In this game there is a wild and a scatter, as well as two bonus games. While you're playing in one of the bonus games, you can actually activate the other. Five wilds in an enabled payline brings a 10,000-coin payout. The wild in this game is the Wheel of Wealth symbol. As such, it is a symbol that can substitute for any other symbol (except for the scatter) to complete winning combinations. It doubles the payout for any of the combinations that it completes, which is important to remember. It can also comprise a winning combination all by itself, and it is very powerful in that regard, because five of them from left to right on an enabled payline will yield 10,000 coins. Four of them bring a 1000-coin payout. The only other thing to remember here is that when a winning combination consists solely of the wild symbol, its payout is NOT doubled. The "scatter" symbol is the Scatter Coin. Being a scatter means that the symbol does not have to be on an enabled payline in order to win. They can be scattered anywhere on the five reels to have their effect. One of the bonus games is the Reel Bonus Game. This is activated by three or four Bonus symbols (those that simply say "Bonus") appearing on an enabled payline. Keep in mind that the Bonus symbols do not constitute winning combinations in and of themselves. 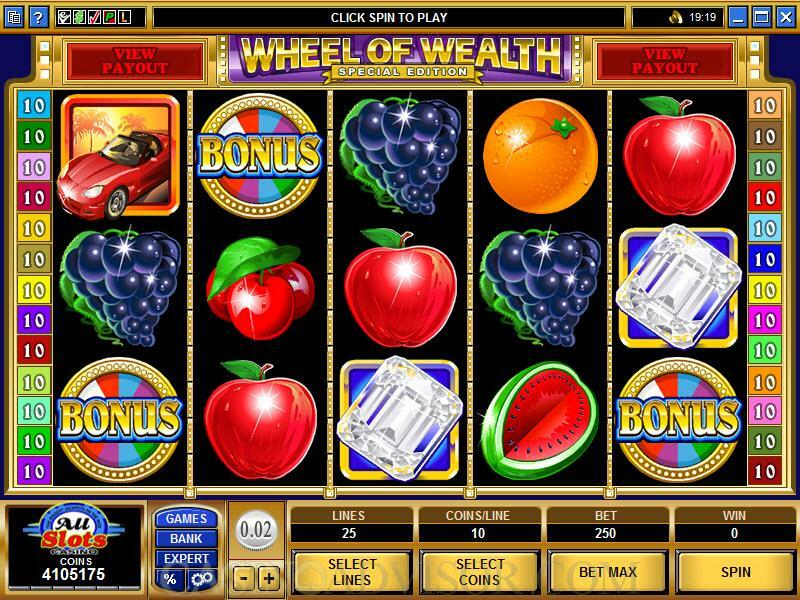 During this particular game, you will select Bonus symbols, which remain active, to reveal bonus win amounts, or, if you are fortunate, a trigger for the Wheel of Wealth Bonus Game. 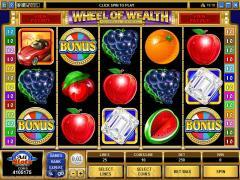 The Wheel of Wealth Bonus Game is what offers the potential of a 10,000-coin payout. It can also be triggered during the course of regular play if five Bonus symbols appear on an enabled payline. There is a wheel in this game, consisting of twenty different components. You spin the wheel, and whatever random win amount the arrow points to at the end of the spin is the amount you win. There is a maximum wager in this game, which is 250 coins, and you can get to it immediately by clicking the "Bet Max" button. The coin sizes come in increments equal to .01, .02, ,05, .10, .20, .25 and .50. You can bet up to ten coins per payline. 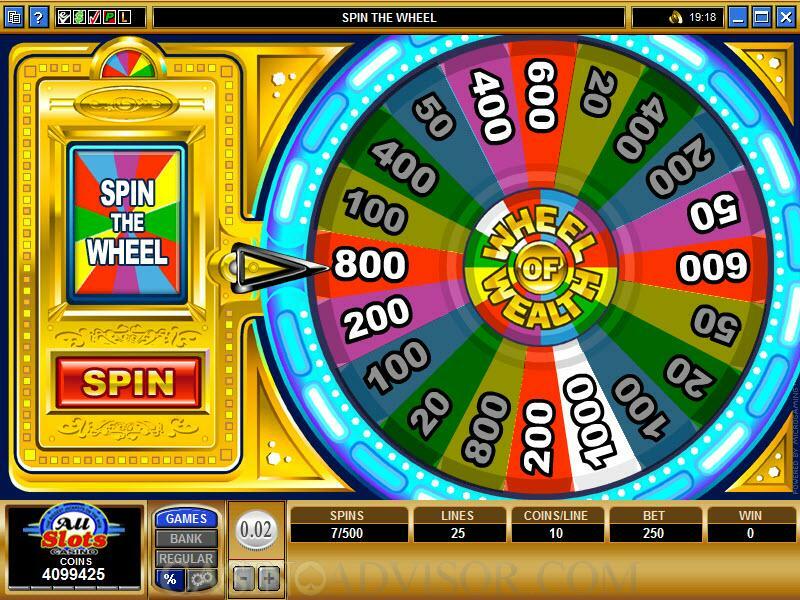 Interested in reading more detailed information about Wheel of Wealth - Special Edition? If so Click Here for more details.